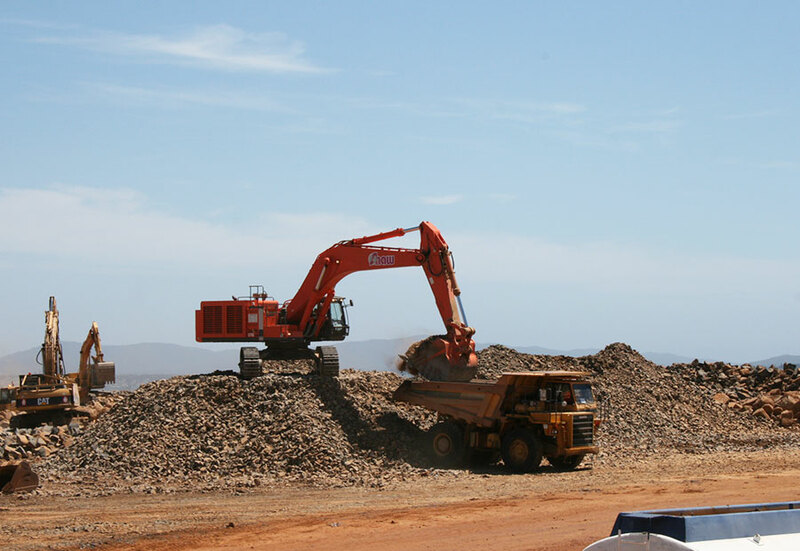 Shaw has vast experience in the construction of tailings dams and earth-fill water dams. 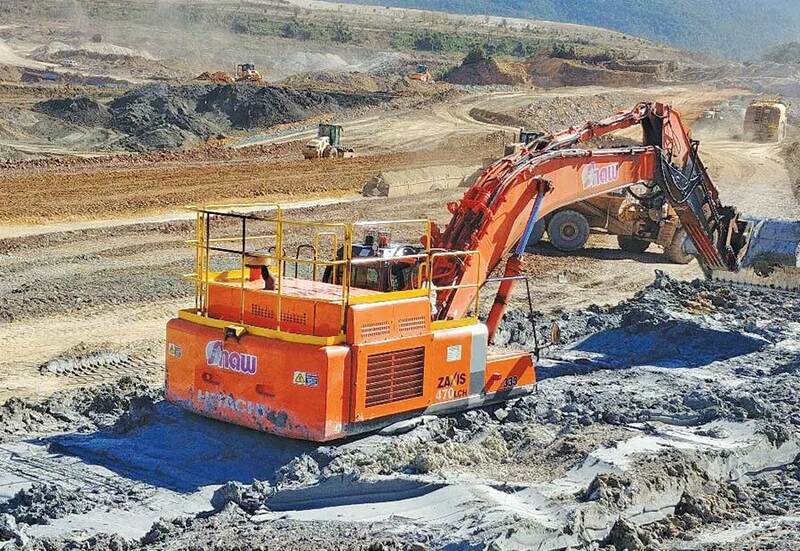 Shaw has constructed major tailings dams for all major Tasmanian mines as well as the Ranger Uranium Mine in the Northern Territory. 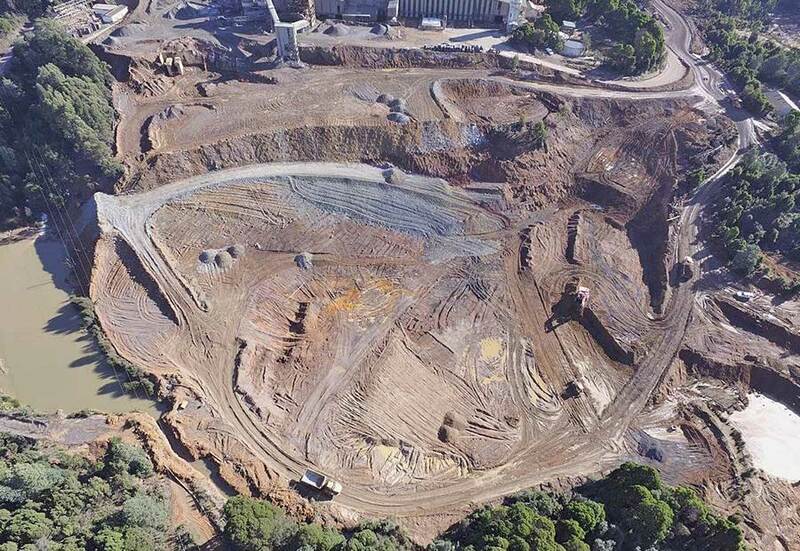 Shaw has recently designed and constructed some of the largest earthfill water storage dams in Australia being 26 metres in height with over 750,000 bcm in the embankment volume. 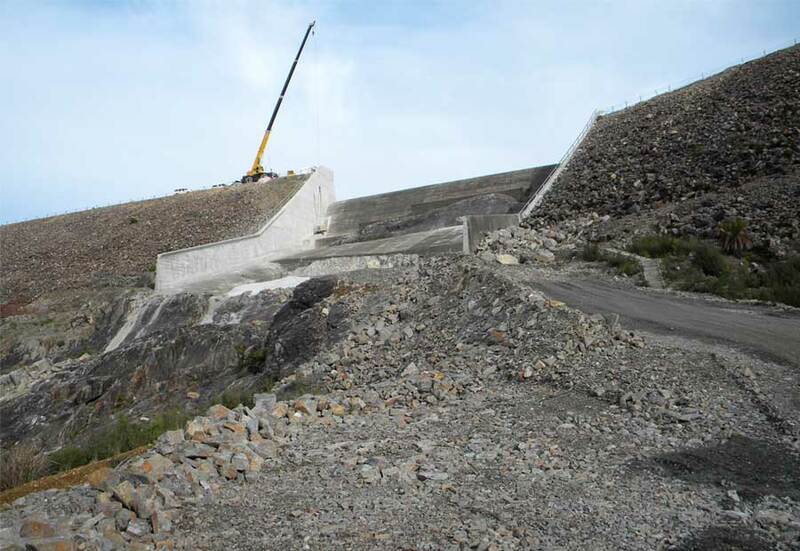 The dams were designed and modelled to ensure that all the safety requirements of ANCOLD were incorporated with significant innovation used in the spillway designs to meet client needs. Shaw has extensive knowledge in this area with dams being a High ‘B’ hazard category. Senior members of the management team have formed part of the Expert Team required to complete the design and construction supervision to ANCOLD guidelines. 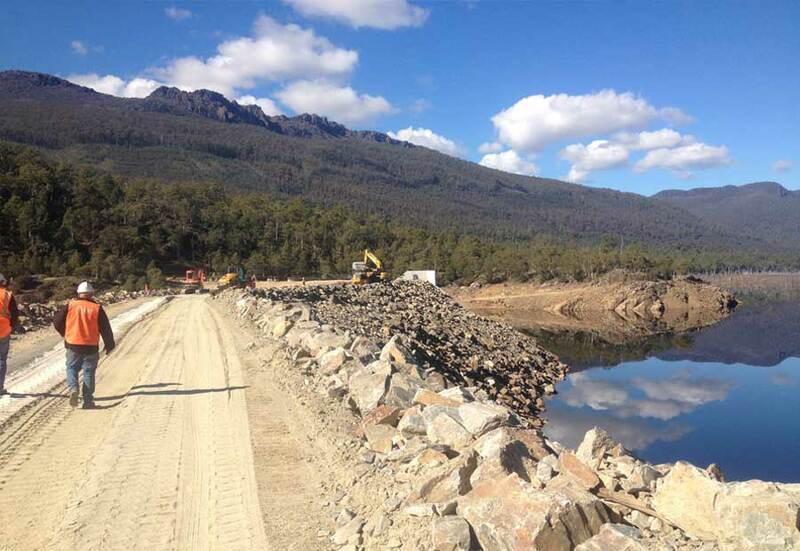 Shaw Contracting was contracted by Tasmanian Irrigation to design and construct the Federal Government funded Dunns Creek Dam as part of the Upper Ringarooma Irrigation Scheme (URIS). The dam is situated 20km south east of Scottsdale in the Ringarooma Valley and the completed scheme now irrigates pasture and cropping land around the townships of Ringarooma, Legerwood and Branxholm. Works commenced in September 2013 and were completed in June 2015. Comply with DPIPWE dam permit requirements particularly in regard to control of sedimentation, maintaining environmental flows, emergency planning and protection of native flora and fauna during construction. Control of runoff water turbidity using large sediment basins therefore preventing sediment entering into Dunns Creek and further downstream into a RAMSAR protected wetland area. Works were completed to the satisfaction of the client and met the design and program requirements. 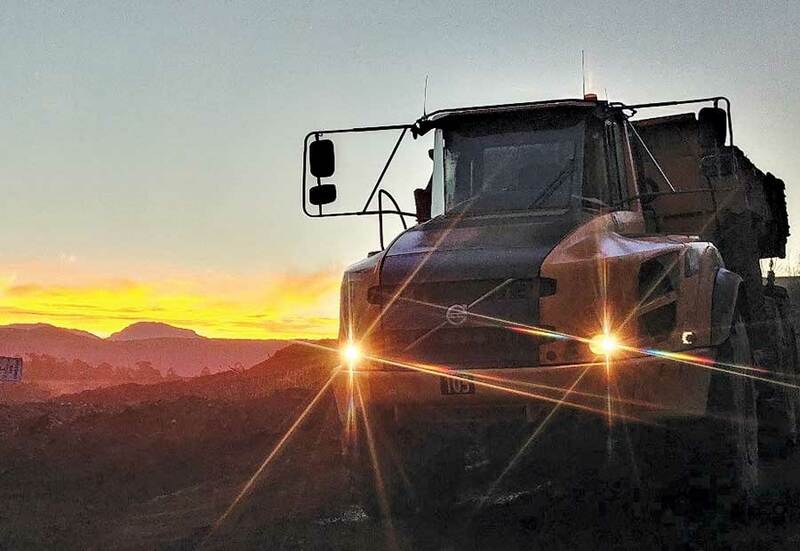 Over 50,000 man hours were recorded on the project with no LTI’s and no significant environmental incidents. 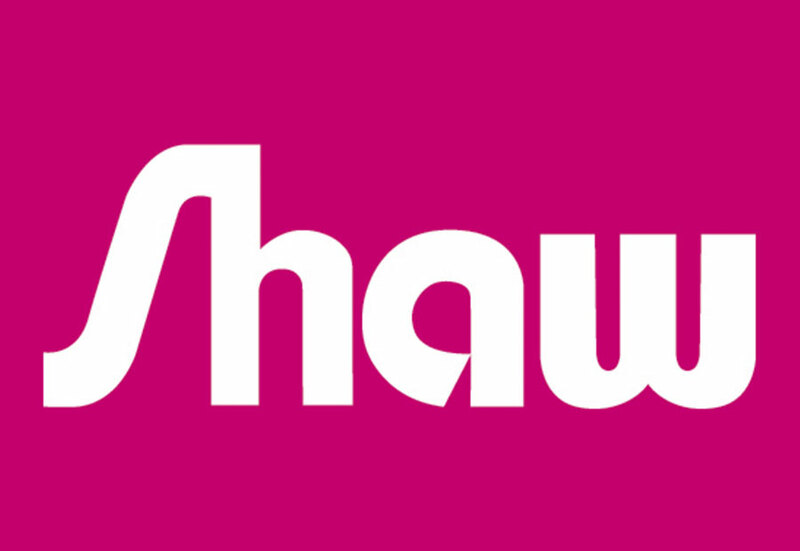 Shaw Contracting worked closely with its client to ensure timely reporting and investigation of incidents and to prevent reoccurrence of similar incidents. The completed irrigation scheme will improve agricultural productivity for the Ringarooma district and provide a safeguard to the local farming community against the possibility of drought. Rowallan Dam is situated in a remote area of Tasmania in an area of high rainfall and compounds the headwaters on the Mersey Forth Power Scheme. 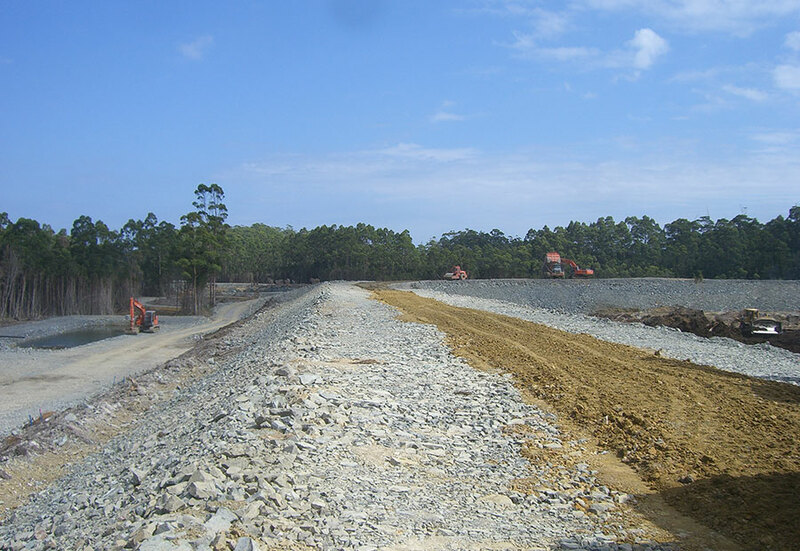 Construction of dual filter zones downstream of the dam core at the spillway walls. Raising of the earth fill core to crest level and provision of dual filters from crest level to a depth of 7m across the entire dam crest. Supply, production and processing of all construction material on the project. Installation of a sheet piled wall keyed in to the upstream toe of the earthfill core. Open excavation up to depths of 14m at each spillway wall. Trench excavation in the base of excavation, clean up of foundation and backfilling. Removal and reinstatement of intake tower access bridge. Open Excavation in to the dam crest and downstream shoulder to a depth of 5.9m exposing the fill width of the earth core and downstream filters. Excavation of the filter trench a further 1.2m depth and backfill with a dual filter. Backfill of the open excavation. Zone 1 Earth fill core was produced both from the existing core material and on site borrow pits. Both materials required screening and processing to ensure correct grade and moisture. Zone 2A & 2B Fine filters were sourced from external quarries and had tight specifications. Materials delivery and testing had to be tightly controlled. Zone 2C Coarse Filters were sourced, processed and conditioned on site to minimise the import of material. 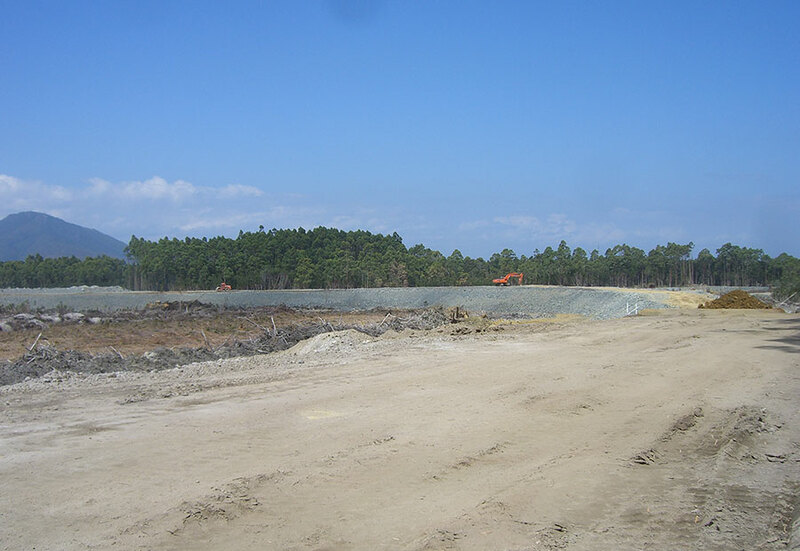 Zone 3 Rock fill was sourced from excavation in the existing dam wall and supplemented from onsite borrow pits. Works were completed on time meeting all contractual handover dates. Works were carried out over a period of 8 months with 4 crews working a 24/7 roster on works at the spillway wall. Over 32,500 man hours were worked on the project with no LTI’s. In excess of 450 individual soil tests were carried out by Shaw to ensure material supply and placement compliance in line with the specification. No significant environmental incidents were recorded on the project. The contract for Allegiance Metals Pty Ltd required development of the mill site including bulk earthworks and drainage, construction of stage 1 of the Tailings Storage Facility (TSF) including decant structure and seepage collection system, construction of the site access road, and connection of the above works to the Water Storage Dam, wetlands ponds and settlement pond. Site excavation including clearing and grubbing, stockpiling topsoil, stripping embankment foundation, excavating cut-off trench and preparing surface for placement of embankment material. Excavate decant pipe trench, from bedding for pipe placement, supply and install stilling basin at decant pipe end. Cart, place and compact embankment material. Supply and install seepage collection drain and seepage outlet pipe. Trim final embankment profile to shape. Supply and place base course for road along crest, form safety bund on downstream edge of crest, spread evacuated topsoil over embankment downstream face. Drilling, loading of explosives and blasting rock in rock borrow pit. Installation of tailings discharge pipelines. Supply and install seepage outlet pit V-notch weir at the seepage outlet pipe. Supply and install pit, mill return pump and return pipe at settlement pond outlet. Supply concrete anchor block at decant pipe outlet. Works were completed ahead of schedule to allow construction of the process plant. "This major tailing storage facility was completed ahead of time and budget and to client satisfaction." 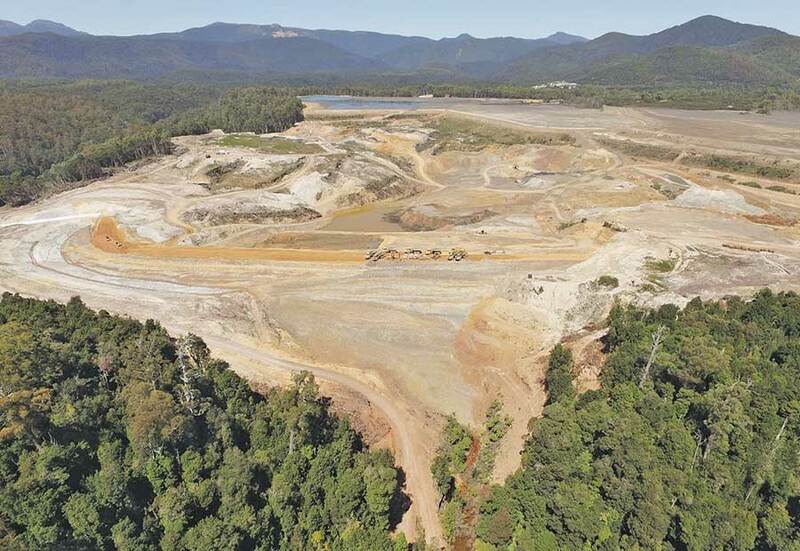 The discharge of tailings from the Mt Lyell mine on the Tasmanian West Coast has caused significant environmental impact for more than half a century. 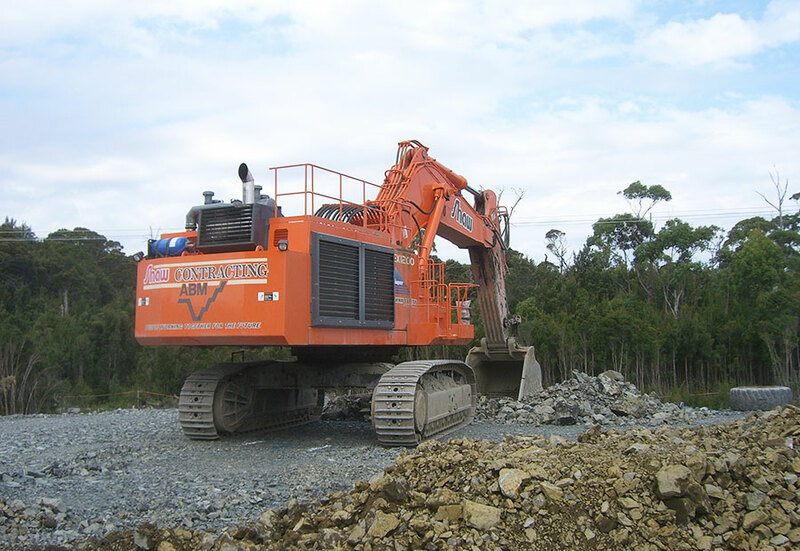 The new lift by Shaw Contracting will ensure sufficient capacity in the dam to allow continued mine operations. The most suitable form of dam construction was a conventional earth and rockfill dam with a conservatively sized clay core. The Princess Creek was originally chosen as the site for the dam due to its relatively impermeable foundation, no economic potential for mineralisation, a frequently burned site with little remaining vegetation and close location to dam construction materials. The dam was designed essentially as a water storage dam and ignored the low permeability of the tailings. The dam was initially designed to be raised in a series of lifts to cater for progressive increases in tailings production and has the capability of reaching 75m in height and storing 160 million tonnes of tailings. The works included the installation of a new decant structure and the decommissioning of the existing. The Princess Creek Tailings Dam consists of a 32 metre high earth and rockfill embankment containing 400,000m³ of clay core material, 25,000m³ of rockfill and 15,000m³ of filter material. The dam has a breadth of 210m at creek bed level and a crest length of 400m. All material from the dam was sourced from site excavation and borrow pits, including blasted rock from the new spillway. 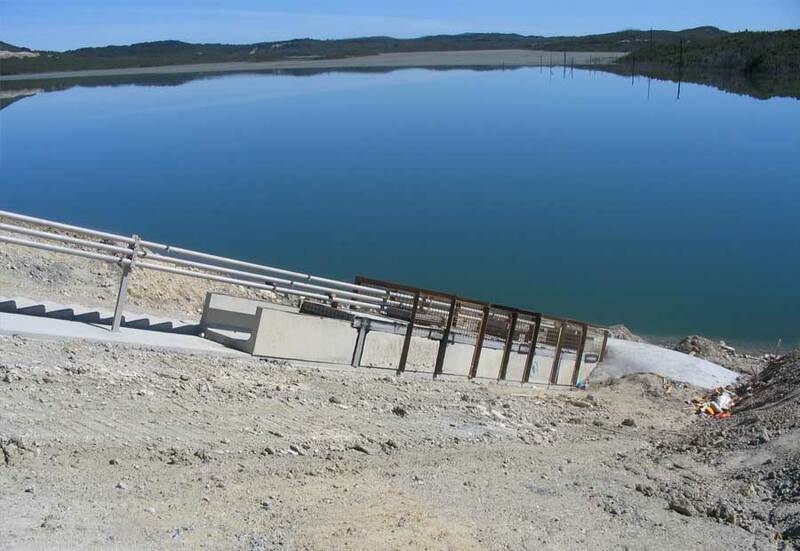 The dam was designed with a cut off trench up to 15m deep to reduce the amount of seepage through the foundation. Grouting was undertaken to abutment areas on this contract to ensure that seepage did not occur on these areas. The completion of this project met program, budget requirements and client’s expectations in terms of environmental controls and water quality downstream. 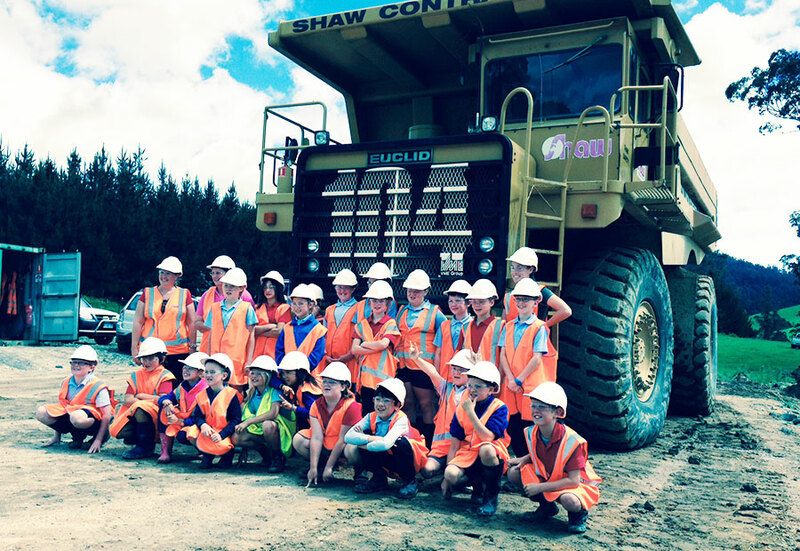 "This project utilised various in-house resources for major earthworks, dam construction and civil works under typical West Coast conditions..."
In December 2016, Shaw Contracting commenced construction of a new tailings dam to support existing operations at the Renison Tin Mine. The Renison mine is an underground tin mine located near the town of Rosebery on the West Coast of Tasmania. It is the largest operating tin mine in Australia. 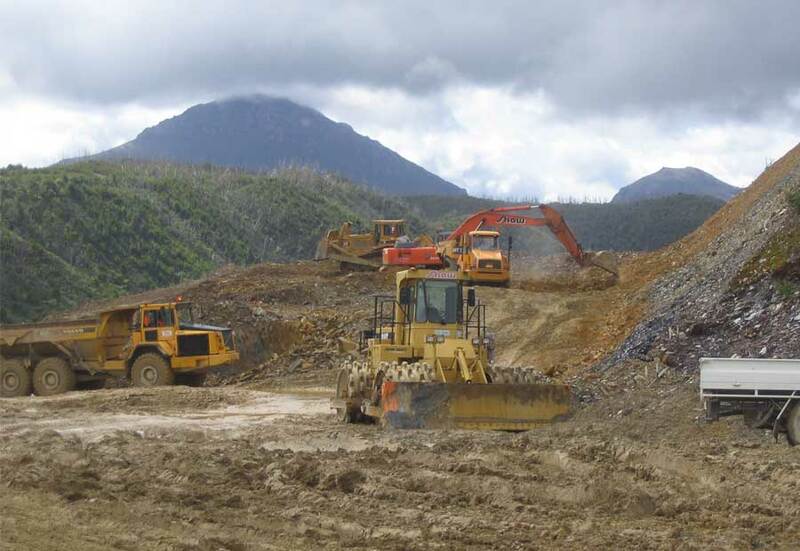 With an extremely high annual rainfall, a remote location, challenging geotechnical conditions, program constraints and an environmentally sensitive location surrounding the worksite, the dam construction works made for a challenging but rewarding project. The project involved the construction of a 700,00m3 earthen dam wall with a pressurized grout curtain, clay core, horizontal and vertical filters, PAF waste rock cell, concrete decant tower structure, monitoring instrumentation and an emergency spillway. Total excavation volume was 1,200,000m3. Low strength liquefiable silt up to 10m deep was encountered in the dam foundation excavations. This silt proved very challenging to excavate as it tended to slump and could not support the weight of earthmoving plant during excavation. 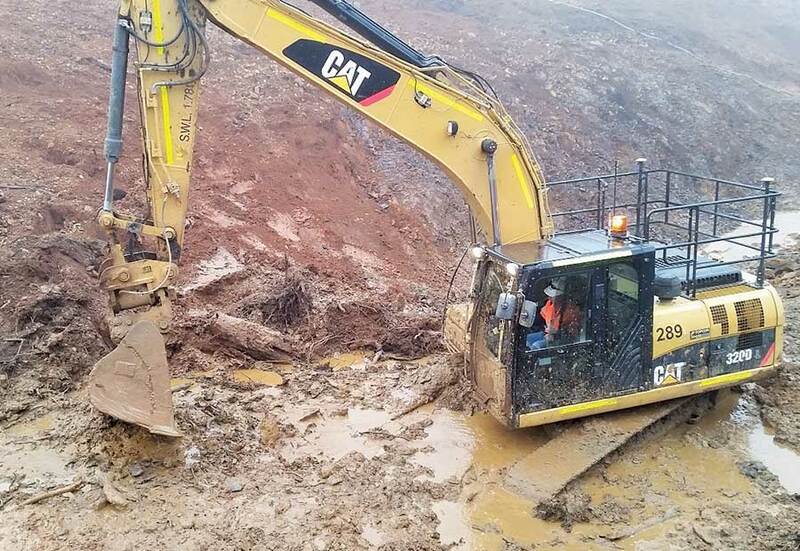 Shaw Contracting engaged a geotechnical engineer to complete a temporary slope design to reduce the risks associated with this work which allowed the excavation works to continue safely. 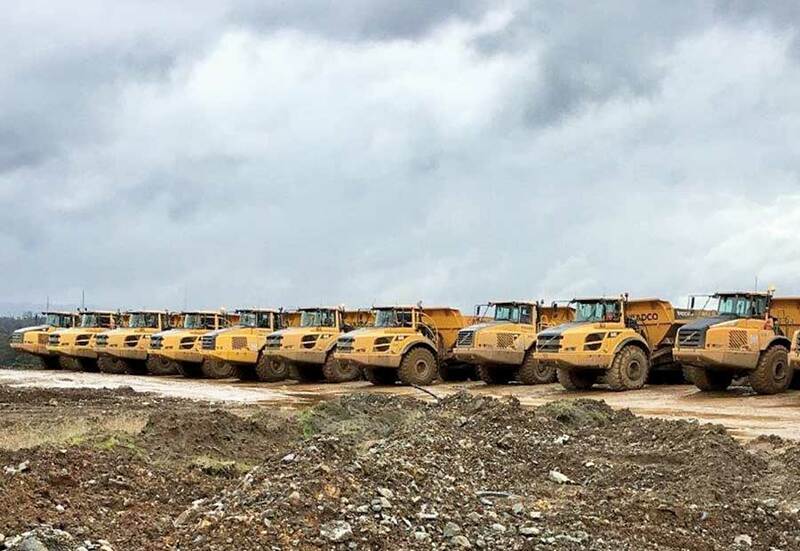 With up to 50 items of mobile plant on site at any one time, one of the major risks to be mitigated was the interaction between mobile plant. This was achieved by seeking input from the whole site team which meant that practical control measures could be developed and implemented by the team. Annual rainfall averaged 2,200mm which is over 3 times more than Hobart and Launceston’s average. This presented a significant challenge to clay core placement which was overcome by using weather forecasting data in combination with detailed long term and short-term program planning. Vertical sand filter boxes were used to place sand filter material and prevent contamination between materials, a total of 10,000m3 of filter was placed using the boxes. Excavators used to place the boxes were fitted with GPS allowing a final construction tolerance of +/-50mm. There was very little contamination or wastage of materials and the use of the filter boxes effectively segregated filter materials from other material zones in the dam wall. 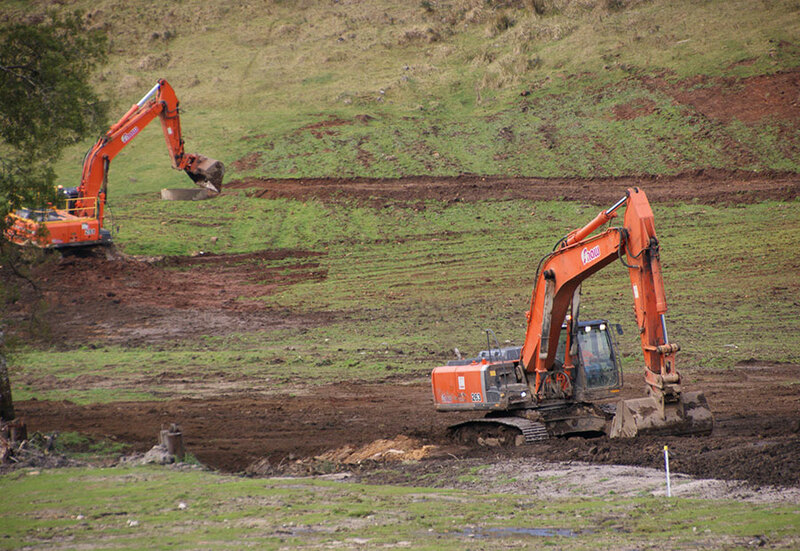 Sediment control both at the construction site and external borrow areas was a high priority given the close proximity of Lake Pieman with all discharge from site flowing into the lake. 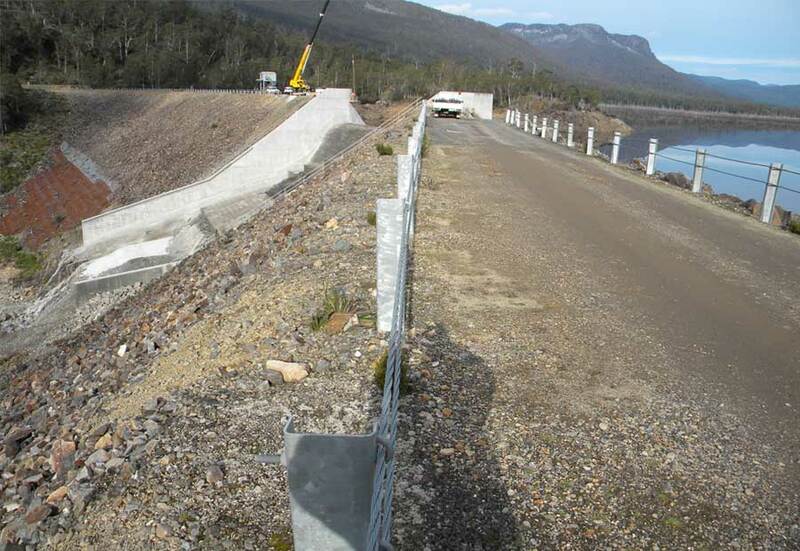 The management of water and sediment was made more difficult due to high rainfall on the West Coast of Tasmania with water from the dam footprint flowing through a natural water course in the centre of the new dam wall. Sediment was controlled through the construction of a coffer dam to capture water and sediment upstream of the wall construction zone with the water pumped around the wall before flowing into Lake Pieman. There was little sediment transport into the Lake and no observable sediment plume. 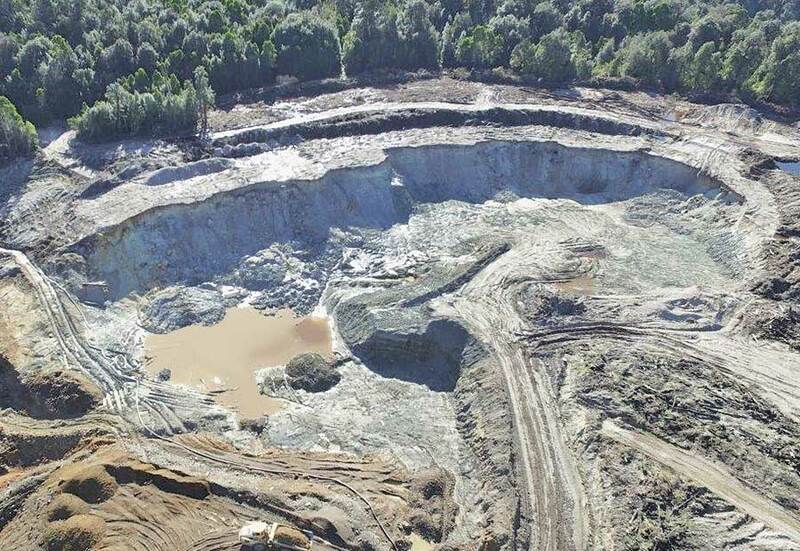 The construction of the dam also incorporated a cell within the impoundment footprint to encapsulate potential acid forming (PAF) waste material generated through historical mining activities. The PAF had previously been stored in a general waste storage area at the mine. The new cell was clay lined and compacted to prevent water and oxygen from reacting with the PAF in order to avoid the generation of acid rock drainage. Potential leachate from the cell, while under construction, was captured within another smaller control structure to ensure there was limited impact outside of the dam footprint. The discovery and subsequent removal of lacustrine material from the dam wall area introduced another unexpected source of PAF material that also required storage and containment within the new dam footprint. The site management team sought input from all site personnel by encouraging open and informed conversations with regards to risk management. This promoted a culture on site where safety has priority over all other considerations. Shaw did not have one major OHS or environmental incident over the 75,000 man hours worked during the project. Shaw did not receive any major quality non conformances on this project, this is a credit to the skill of the operators and management team on site. Shaw employed local West Coast operators to supplement the team, some of which had been out of work for a considerable time. Shaw was able to help support the west coast economy by creating job opportunities for local operators and contractors. Shaw monitored production of all materials on a daily basis and presented this in a graphical format to the client. This daily monitoring helped to identify construction program issues early and deploy additional resources as needed to maintain the program and ensured completion by the contracted date. 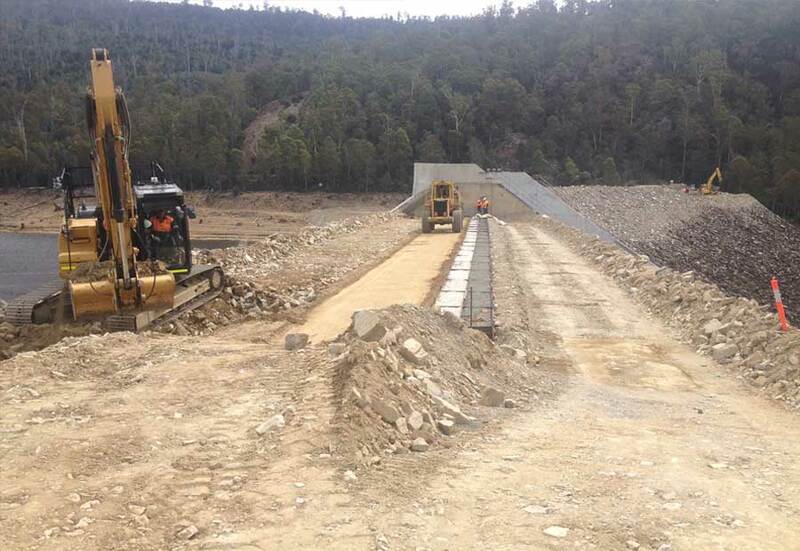 Construction of stream storage at Swansea on Tasmania’s East Coast. 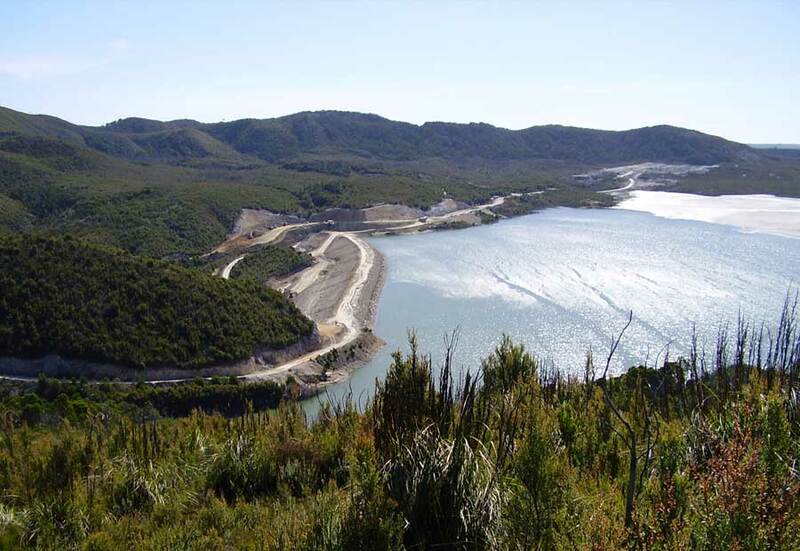 The main dam was categorised as a High A hazard and is only the second dam in Tasmania to be built in that category. Other inclusions in the contract were a second saddle dam and a 4km water supply pipeline. Construction commenced in February 2009. Shaw Contracting was actively involved in the design issues and construction working as part of the required expert team. 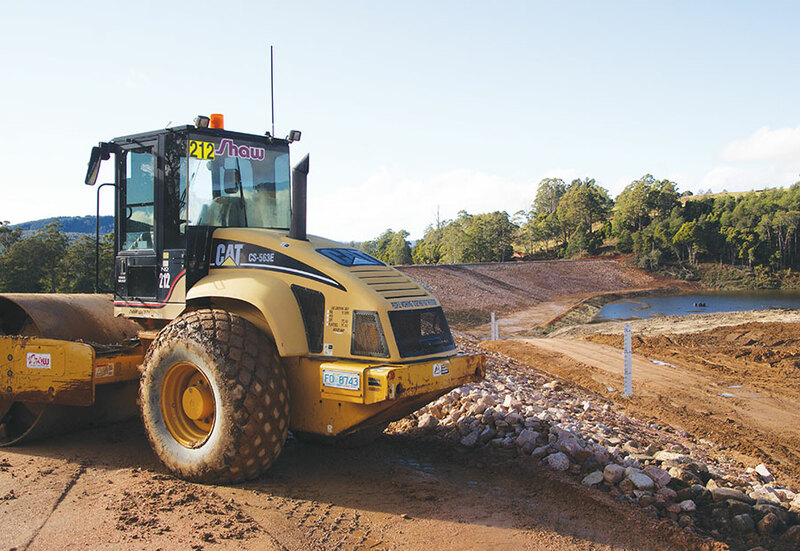 Shaw Contracting completed the main dam consisting of 130,000m³ of earthworks with a wall height of up to 11m. The main dam wall consisted of 4 zones with zone 2 requiring both a vertical and horizontal sand filter. The main clay core was monitored and tested daily to ensure quality and economic use of materials. 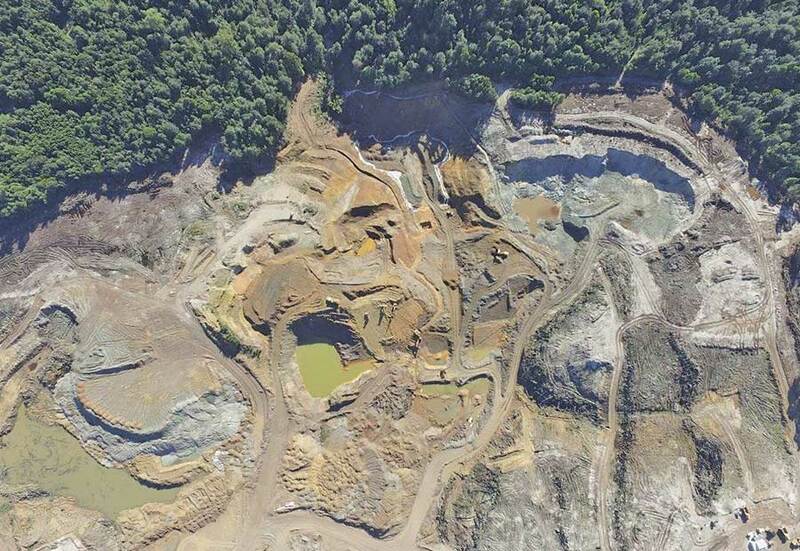 All dam materials except filter sand were taken from the site making management of the borrow pit critical. The dam was successfully completed in November 2009. The dam and pipeline are now ready to provide water to Swansea residents and visitors during the summer months.